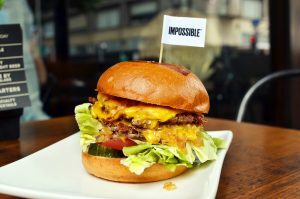 So when I heard about Impossible Foods testing their soy-heme on rats, back in August, I immediately stopped promoting and eating the Impossible Burger. It wasn’t a difficult decision for me, really. After all, as an ethical vegan, I have avoided all animal exploitation and use; for food, clothing, entertainment, and animal experimentation, to the extent of the choices I have available. As the parent of an 11 year-old beagle named Frederick, who was rescued from an animal testing lab six-plus ago, I could not in good conscience continue to support, promote, or eat a product that had been tested on a fellow animal. As I am sure most of you have, I’ve seen plenty of undercover videos from testing labs. Marc Ching, who is known for going undercover in the dog meat trade in Asia, recently went undercover in an animal testing lab in China. He said that the lab was far worse than what he sees in dog slaughterhouses. He should know. Using products that were tested on animals is generally not considered part of an ethical vegan lifestyle. If a brand of lipstick is tested on animals, no one would have a problem if I did not promote the company. But when it’s a trendy new food that is getting a huge positive buzz, suddenly people are willing to look the other way. I also wonder: if the Impossible Burger was tested on beagles like Freddie, rather than rats, would there be such vociferous vegan support? In case you’re wondering, the rats were overfed soy heme, monitored for any ill health effects, and then Impossible Foods killed the rats to study their internal organs. It’s easy for me to see those rats as dogs as cats as mice as cows as…you get the point. It’s confinement, exploitation, and violence – for the sake of a veggie burger. Was I a little bummed because the Impossible Burger tastes good? Sure. So did sushi and brie. But ultimately, exploitation loses its flavor and appeal. Now I’m seeing a lot of noise on the socials about “vegan purists” who have chosen to boycott and not promote the Impossible Burger as well, by the loudest and most popular voices in the movement. People are being attacked for “hurting animals” and accused of being hypocrites because we use cell phones, drive cars and use computers. As if there is an equivalency between eating a veggie burger, and, say, conducting business. I happen to use my computer and cell phone mostly for my PR business in which I promote animal nonprofits and vegan for-profit businesses like Animal Place, Vegan Wines, and Wild Earth – shameless plugs for those working to save animals from exploitation. I’ve even seen vegans taken to task for using medication because it was tested on animals. Do I really need to address that? This doesn’t mean that I want to see Impossible Foods fail. If I were vegan king, I’d like to see vegans stop promoting and buying their products, but alas, I was not born with such a destiny. Of course I prefer that nonvegans order an Impossible Burger over the flesh of an exploited cow. That should be obvious. However the reality is it doesn’t matter what I or any other vegans in this debate want, the Impossible Burger has taken off and will continue to do so, with or without our tiny community. Yes, we live in a confusing, capitalistic world where vegan food products are going to one day all be owned by companies that exploit other animals. It’s inevitable. And everyone is going to have to navigate these murky waters by their own inner compasses – as some of us are doing today by avoiding products that were tested on animals. It doesn’t make us purists because we choose not to support a company that willingly tested their product on animals, which the FDA does NOT require, and that refuses to commit to never test again. It just makes us…vegan. Beautifully put. A voice for all.